A light and refreshing Strawberry JELL-O Poke cake. 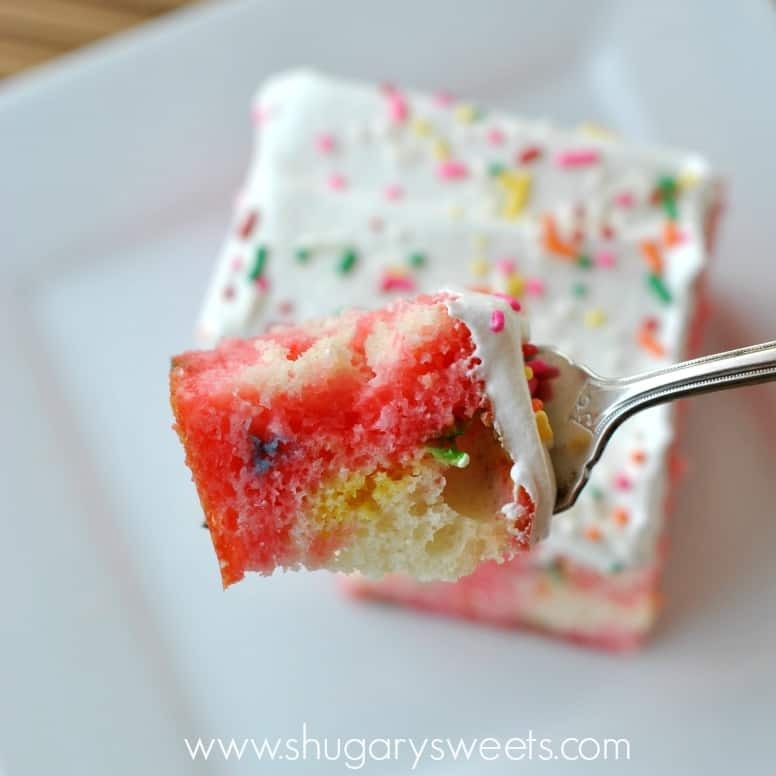 Add a twist of fun by baking up a Funfetti Cake! Did you know there is a new trend sweeping across the blogosphere? It’s called Poke Cakes. You may have been making these cakes for years. I know I grew up eating poke cakes without every really knowing what they were called. In our house we called them JELL-O cakes. There are a few different styles of poke cakes but basically they stem from TWO types. First, you have a poke cake made from a cooked a cooled cake topped with sweetened condensed milk and all other sorts of glorious toppings. This creates a dense, very sweet (albeit delicious) cake. Second, you take a cooked and cooled cake and top it with JELL-O gelatin. It’s lighter than the other variety and perfect when you are looking to cut calories, but still wanting to to enjoy something sweet. Today’s recipe is for a classic gelatin based poke cake. 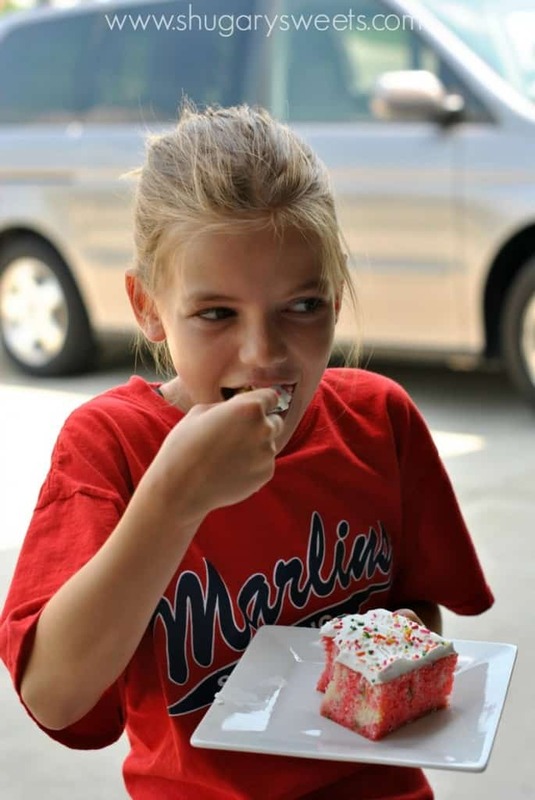 I started with a Funfetti Cake Mix, because my kids love all things with sprinkles. But a white cake mix would be a more traditional choice. I topped my cake with Strawberry Gelatin, it’s our favorite and we usually have about 925 boxes falling out of the pantry! Any flavor though is delicious. I love the spongy texture from the cake combined with the gelatin! I spread some Cool Whip on top of my cake and added a handful of sprinkles (more the merrier)! Some people add fresh fruit, graham cracker crumbs and other toppings. Today, I’m going simple. A light and refreshing Strawberry JELL-O cake. 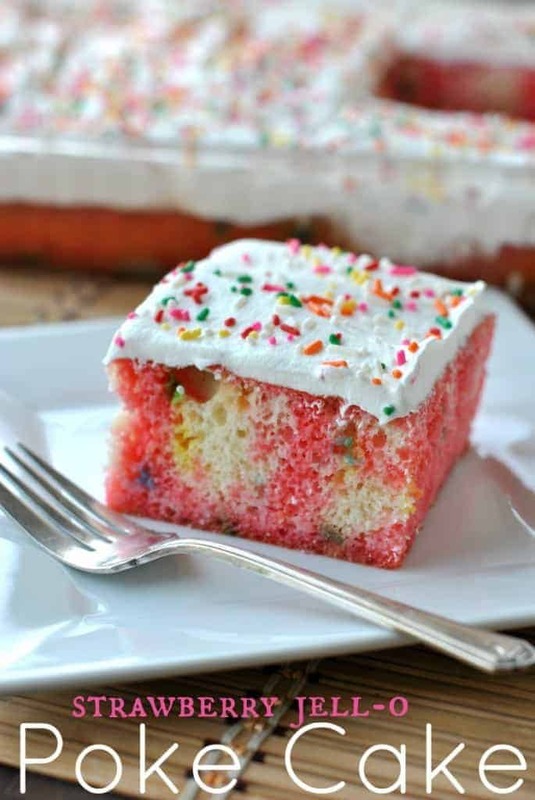 Add a twist of fun by baking up a Funfetti Cake! 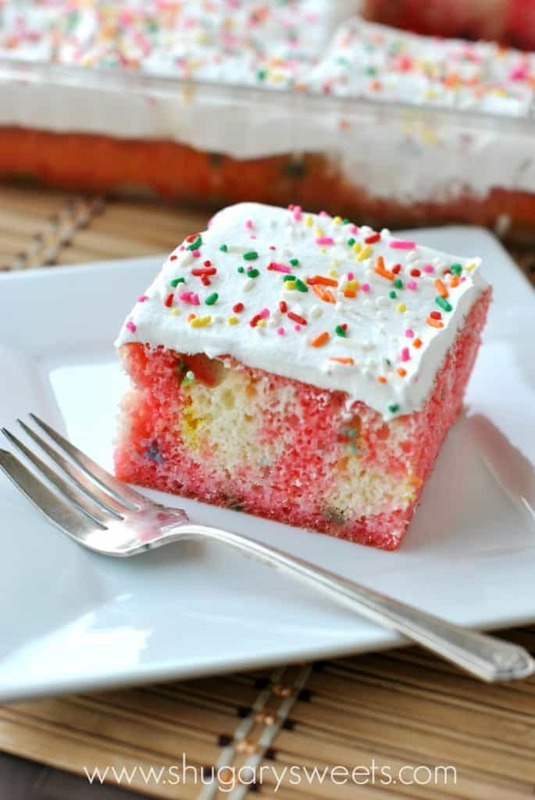 1 box (18.25 oz ) Funfetti Cake Mix, prepared with ingredients. In a small bowl, mix gelatin with boiling water. Stir until sugar is dissolved. Pour gelatin over cake slowly, allowing it to fill the holes in the cake. Top with Cool Whip and sprinkles. Refrigerate for 4 hours, or overnight. ENJOY! Want more delicious Poke Cake recipes? You’ve come to the right place! Try making a white cake with red and blue gelatin. 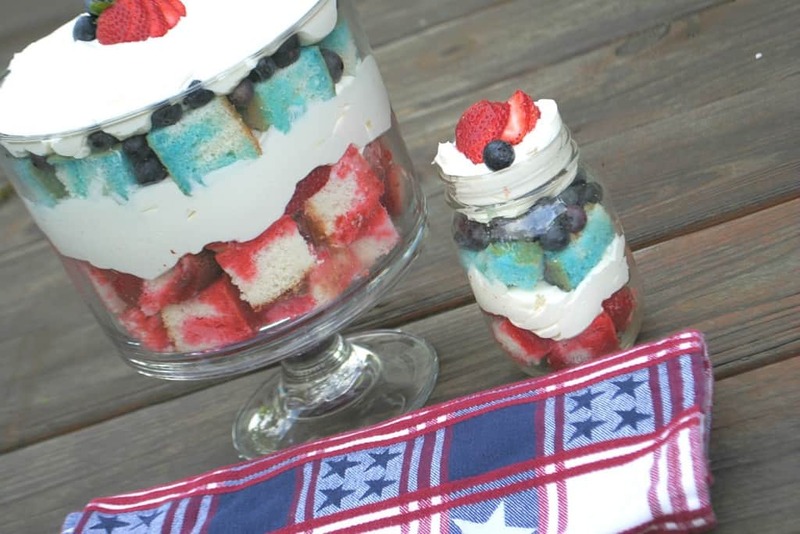 Turn it into a lovely cheesecake trifle with fresh berries! 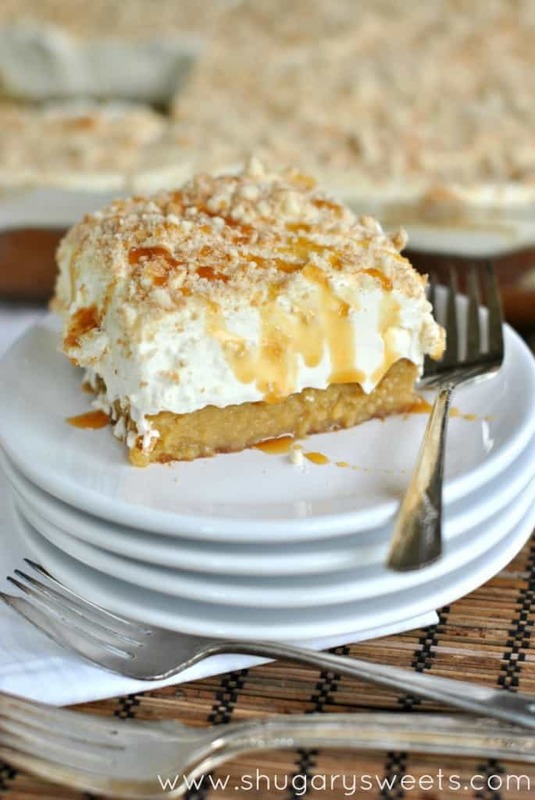 Indulge in a rich Banana Caramel Poke Cake dessert! 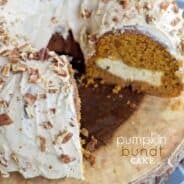 Check out these awesome recipes from my favorite blogs…. Today’s recipe for Strawberry JELLO Poke Cake was originally published on Shugary Sweets on July 4, 2013 and has been republished in June 2018. What a sweet cake! I love the pink colors, so festive and summery and a cinch to make. That’s always the best dessert. 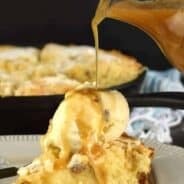 I love an easy dessert that tastes awesome. This cake fits the bill! Thanks for stopping by Cathy! I have tried the sweetier version of poke cakes but I have feeling I will like the Jello version more. Lighter equals bikini friendly in my book. Aimee, does the cake lose it’s sweetness with the applesauce and water vs preparing it the normal way? I haven’t tried cakes with the applesauce but do it all the time with brownies and they are just a little less sweet but I prefer them that way. 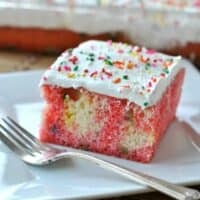 I’ve never heard of adding gelatin to poke cakes, but it sounds like a wonderful way of adding other flavors easily to cakes! Ohhh how pretty! I need to try a poke cake! This is gorgeous Aimee! LOVE strawberry! Happy 4th! MMM my two favorites funfetti and strawberry!! LOVE LOVE LOVE!! I love this idea. It’s definitely going on my ‘when I have kids’ recipe list. I made this for our BBQ dessert tonight and it was so good and was a huge hit! I must live under a rock because I’ve never heard of or tried poke cake. I know..crazy..:-) It’s now my new favorite especially with the funfetti cake mix and cool whip topping. Loved it! I’m so glad you made the cake and loved it! Thanks for coming back and letting me know! This cake brings back memories of making poke cakes for my girls when they were young, moons ago. I think i may just make it again since both of them are home for the summer. It’ll be a nice treat. I adore Poke Cakes!!! This one is so pretty and festive! Thanks Chandra! Have a great weekend!! I haven’t had a cake like this in a long time! This looks so delicious! I have never heard of poke cake. Love this idea. Looks so fun! 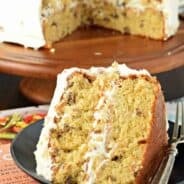 Could I use a yellow cake mix or would that mess with the flavor to much? I have all the ingredients, except I only have yellow cake mix. Id like to make it tonight though. I made this cake yesterday and it’s nearly gone! I wanted to make it low cal, but when you send your daughter to the store for the items you need, you get what she brings back! No complaints, though – it was delicious! I blogged it and linked back you to Aimee! you used 1 cup of boiling water for the gelatine? It sounds like a lot of water! Won’t the cake get very soggy? And do you poke the holes all the way down to the bottom of the cake, or just nearly to the bottom? Do you leave the cake in the pan that you bake the cake in. I flip my cake onto a cake board to take to different functions but notice that the bottom (top before flipping) gets all mushy with the Jello. Do you have any suggestions as to what I can do so that it won’t be a mess when it’s served. I do leave mine in a pan. The bottom is soft from the JELL-O. You could purchase some 13×9 sized disposable pans and use those when taking the cake somewhere. Then you don’t have to worry about leaving the pan behind!